Queimadela (Coimbra, 1985) at the gallery. 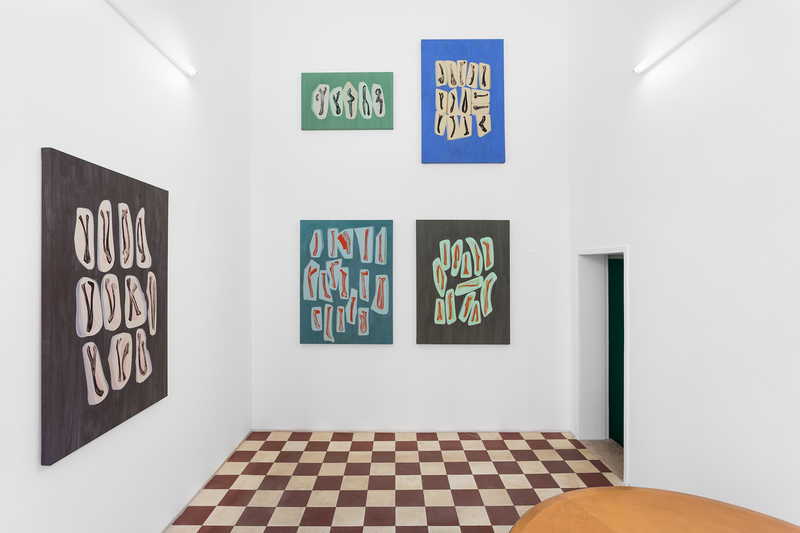 They began sharing and collaboration during their studies at the Fine Arts Academy in Porto and have been working as an artist duo since 2010. 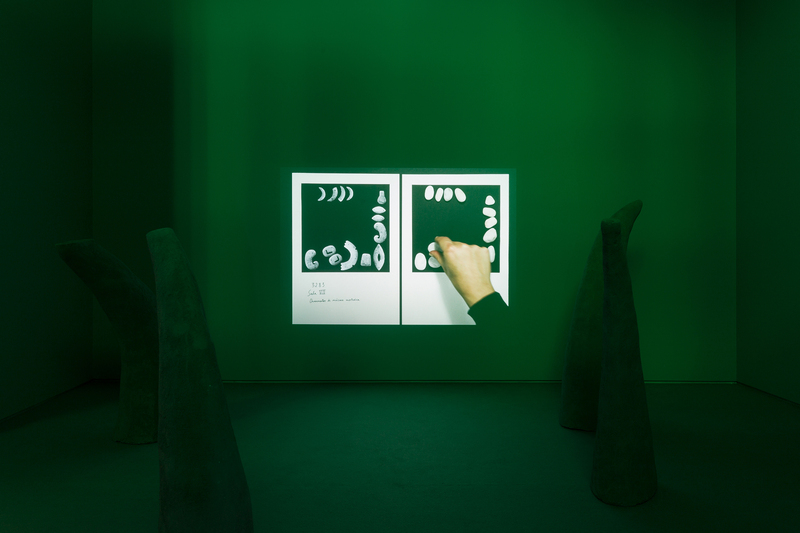 Their practice is developed with a privileged use of moving images, intersecting installative and site-specific environments, and also drawing, painting, photography and sculpture. 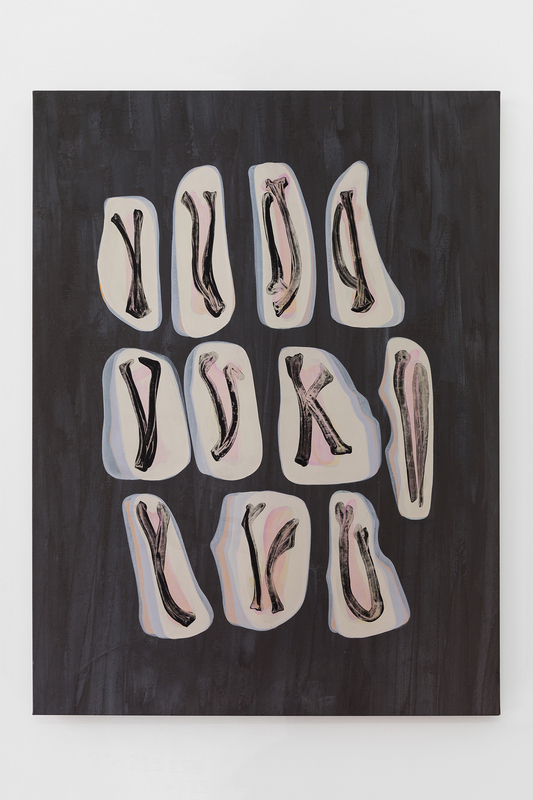 For the exhibition at MONITOR this artist duo developed a new body of work specifically for the gallery space. 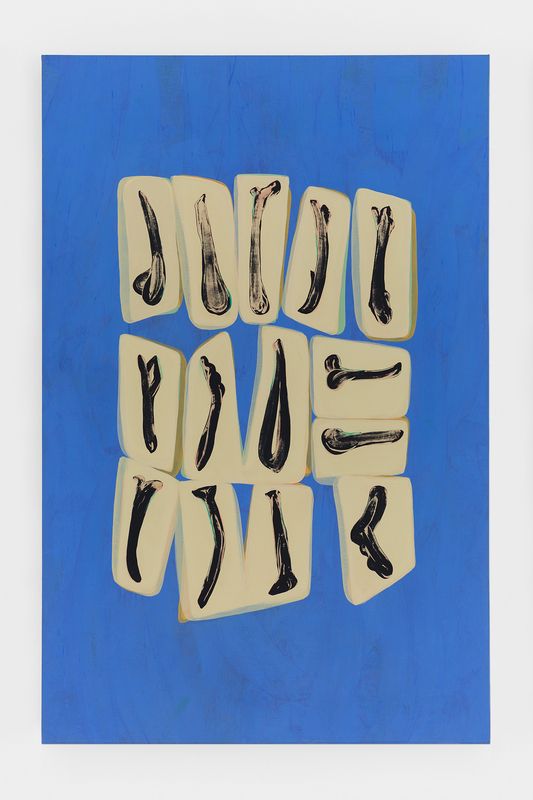 In the first room there are five paintings that present proto characters drawn with gouache over acrylic plaster and pigment, in fragmented compositions, that suggest proximity to a potencial language evoked through bones and inner shapes. 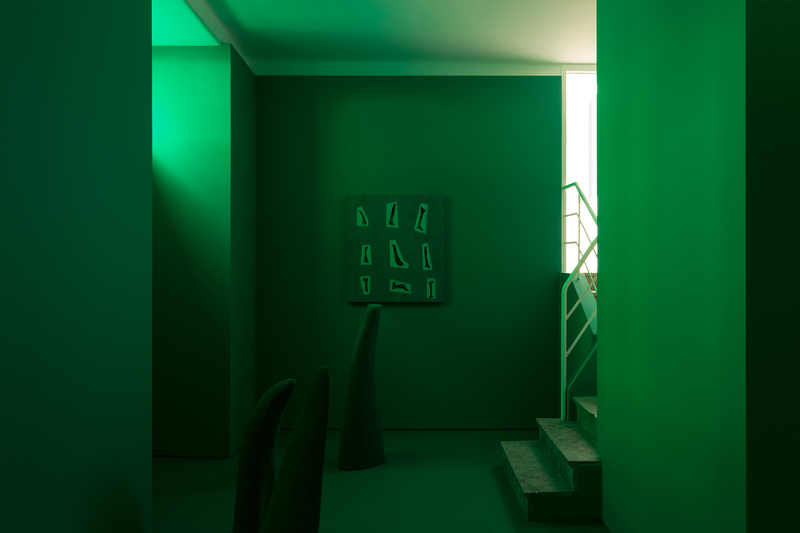 In the basement, an immersive environment was created, a space of projection and acid innerness in which all the elements are wrapped by different tones of green. 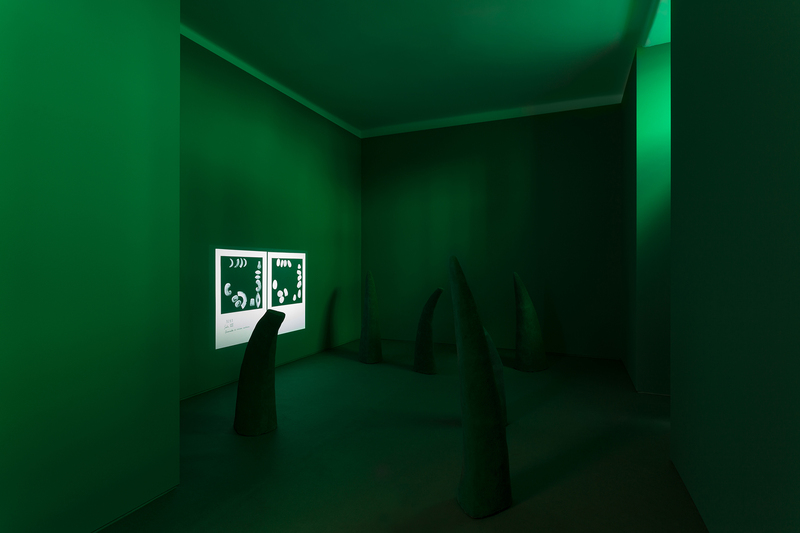 From the floor of the room erupt ambiguous sculptures that evoke horns, turning the environment strange, visceral, aggressive – where at the same time a video where the image of a mortuary mask is manipulated. A MONITOR Lisbon tem o prazer de anunciar Alfabeto Analfabeto, a primeira exposição da dupla de artistas portugueses Mariana Caló (Viana do Castelo, 1984) & Francisco Queimadela (Coimbra, 1985) na galeria. Mariana Caló e Francisco Queimadela licenciaram-se em Pintura pela FBAUP e colaboram enquanto dupla desde 2010. A sua prática é desenvolvida através de um uso privilegiado da imagem em movimento, intersectando ambientes instalativos e site-specific, mas também o desenho, a pintura, a fotografia e a escultura. Na exposição na MONITOR a dupla de artistas desenvolveu um novo de corpo de trabalho especialmente para o espaço da galeria. 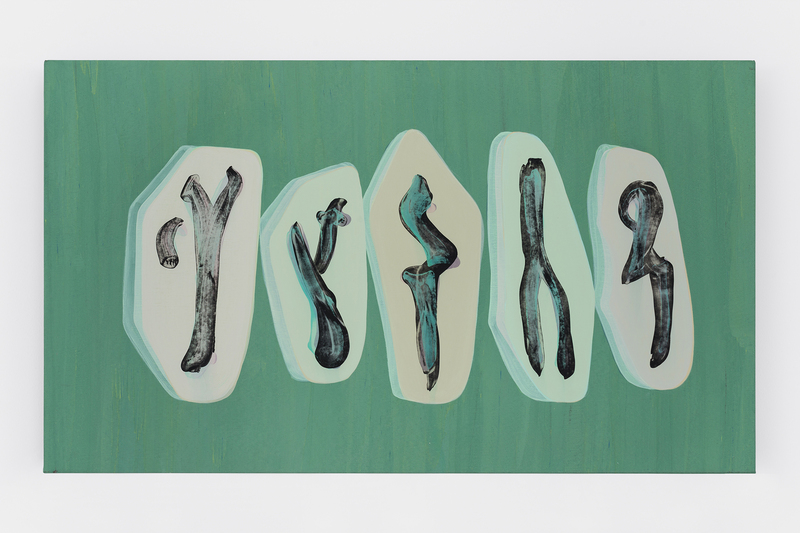 Na primeira sala apresenta-se cinco pinturas, nas quais se inscrevem quase-caracteres desenhados a gouache sobre gesso acrílico e pigmento, em composições fragmentadas, que enunciam uma aproximação a uma linguagem em potência evocada através de ossos e formas interiores. 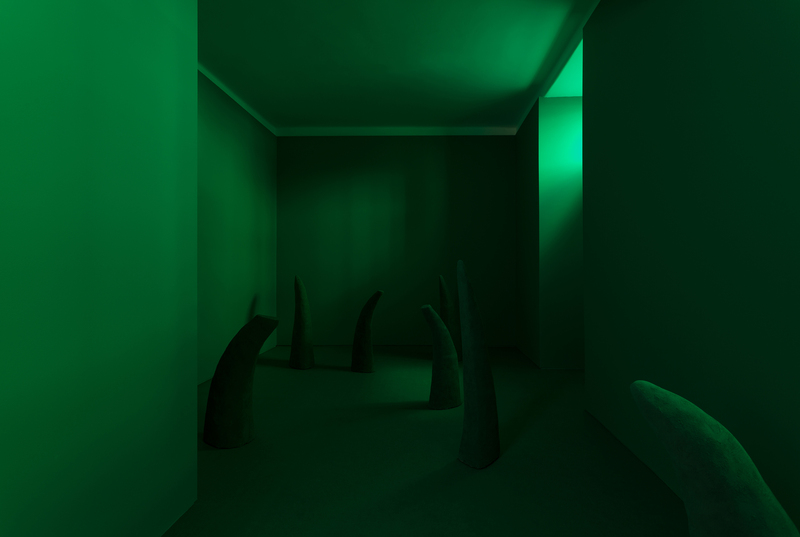 Na cave, foi criado um ambiente imersivo, um espaço de projecção e interioridade ácida no qual os diferentes elementos são envoltos em diferentes tons de verde. Do chão da sala, irrompem esculturas ambíguas que evocam cornos, tornando o ambiente estranho, visceral, agressivo – onde ao mesmo tempo se inscreve um video em que se manipula a imagem de uma máscara mortuária.